Sometimes we all wonder if what we are doing makes a difference? It is so lovely when life gives you a situation where you are reminded of the impact we can all have on one another. 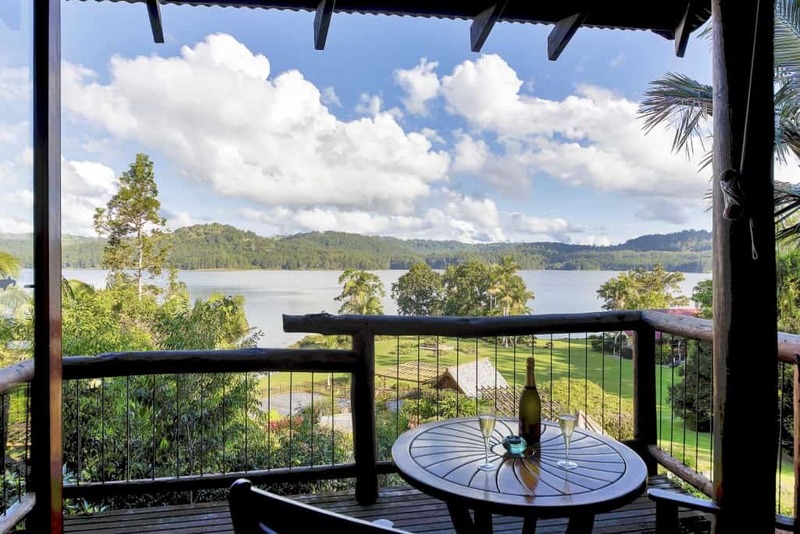 Recently I attended a seminar at Visit Sunshine Coast and was touched to find that the seminar leader had honeymooned at Secrets on the Lake and could not speak highly enough of the experience. But the icing on the cake was when I was leaving the event, much to my excitement, one of the ladies from the tourist team facilitating also approached me warmly, and said exactly the same thing! You should’ve seen my smile! George and I have been creating our dream of Secrets for a long time. When we first opened our doors 25 years ago there were only 15 businesses in the hinterland incorporating Montville, Maleny and Mapleton. We all knew and respected each other, and we met and networked and had fun. Now I believe there are well over 150 businesses and add Air BNB into the mix and things have changed a lot over the years. However, our approach has never changed (unless, hopefully it was for the better). For us its all about the lovely details and thoughtful extras. When you arrive at Secrets on the lake, you don’t just get to stay in a luxury treehouse… you receive our complimentary offerings of a luxury breakfast basket with bottle of wine, home-made scones with jam and cream on your arrival, and croissants or muffins to top up breakfast each morning. Our focus has always been to create the best, most magical experience for our guests, and every detail and feature of our treehouses has this experience in mind. We were the first business in this area to do a luxury BBQ hamper for our guests, and then a honeymoon package… and an escape package followed. Over the years we have put together some romantic and unique extras you can add to your stay to make it suit your personality. Now you can propose in rose petal words and trails, amidst luxury chocolates, cheese platters and celebrate the ‘YES” with a private restaurant prepared meal for 2 in your luxury treehouse. Its your choice! We would be our pleasure to share Secrets with you as well. Just takes a visit to our website www.secretsonthelake.com.au or a quick phone call to our office where the Secrets team will help you. And if you see me in the street please don’t hesitate to come and say hello… I’m still wearing my smile from the lovely comments at the seminar! George and I have just had a week away to our favourite bolt hole on the coast in NSW. We have totally (or almost very nearly) put business on the back burner and spent the time resting, reading, going for walks and even went to the movies to see Bohemian Rhapsody. I actually managed to arrange a manicure and pedicure for myself… a real treat! We’ve tried to be good about food but also have enjoyed eating out most nights. Why? Because who wants to slave over a hot stove when on holiday! To top it off we have had lots of laughs with friends. So… it is with this in mind that I can say with 100% surety that there really is nothing like a short break away to revive and rejuvenate! We returned to Secrets yesterday to find the staff had done really well and all was running like clockwork… and they had even arranged a top secret gathering of George’s nearest and dearest at the Lakehouse for his 75th birthday. He looks great for having had a break. We can only recommend it. We would like to invite you to reap the benefits of getting away from it all and factor in a short break of your own. Some time to reconnect with each other, rest and rejuvenate. When you plan to visit us we have it all covered… the treehouses gleam, the lake is full to the brim and the gardens are flourishing, the chef’s are cooking up a storm, the staff are caring and professional, and along with all that, the Hinterland behind The Sunshine Coast beckons you with its amazing scenery, walks and iconic places to visit. Let us help you to book in some downtime. Call us on 07 54785888 or press the Book Now button on our webpage www.secretsonthelake.com.au. 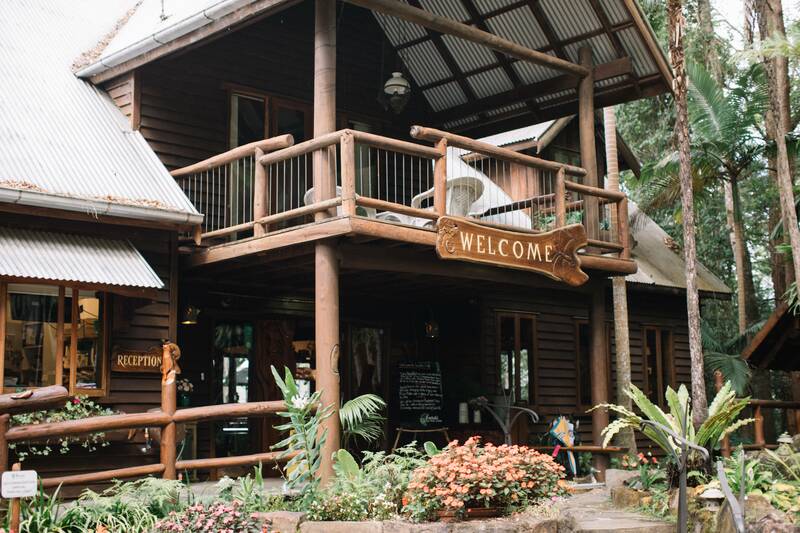 Over the years we have had many, many guests propose, get married, honeymoon, or simply relax and rejuvenate in our luxury treehouse cabins nestled in the lush rainforest overlooking Lake Baroon on the Sunshine Coast hinterland. Some are just like you and me, and some are just like you and me… but famous. Respecting the privacy of every single one of our guests has always been very important at Secrets on the Lake. 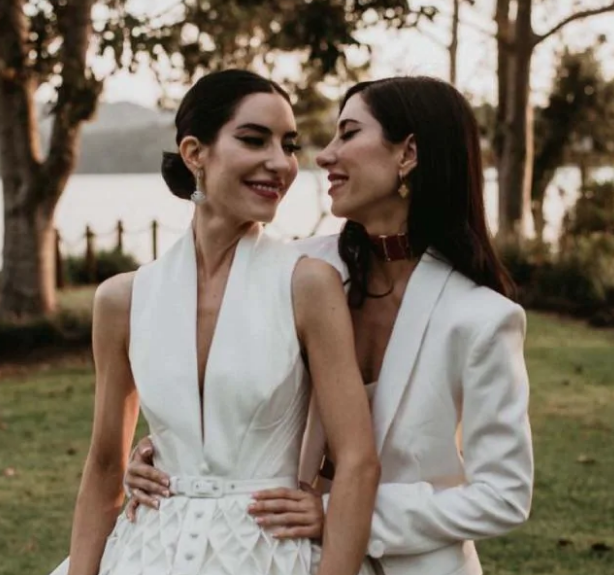 A recent example of this ethic is the gorgeous wedding of the Veronica’s Lisa Origliasso and Logan Huffman here at Montville’s Secrets on the Lake and featured in Vogue Magazine who had exclusive rights to cover their special day. It was our absolute pleasure to be the ones to host their wedding reception a few weeks ago. The Veronicas are more than just another guest to us. In fact, we have welcomed Jess and Lisa nearly here at Secrets on the Lake for more than a decade… and it has always been a pleasure to welcome them through our hand-carved doors! The Veronica’s have not only been wonderful guests but have taken a personal interest in our staff and been very kind to their children and our grandchildren… over and beyond actually! Logan has also been coming now for many years and has a keen interest in our gardens and horticulture, spending hours discussing the gardens with George. Secrets Garden venue has a stunning lake backdrop with magnificent bridges, decks, rockpools and waterfalls… perfect for mingling after a truly memorable ceremony. As nature junkies, our Secrets Garden wedding location was the perfect fit when it came time for this lovely young couple to tie the knot. After much discussion over many months, they created the vintage style wedding reception suited perfectly to them and it has been our privilege to be involved in their special day. Its been very hard to keep such a special secret secret… being famous is both a blessing and a curse. But we would like to remind you that we are all just people… and when it comes to your special day, we treat everyone with the same love, care and respect to make sure that we do everything within our power to fulfil your unique requirements and create the perfect location for your special day. Our Wedding team help to design your dream wedding… from elopements to fully hosted weddings & receptions for up to 80 people. Secrets on the Lake allows you and your partner to make the choices. 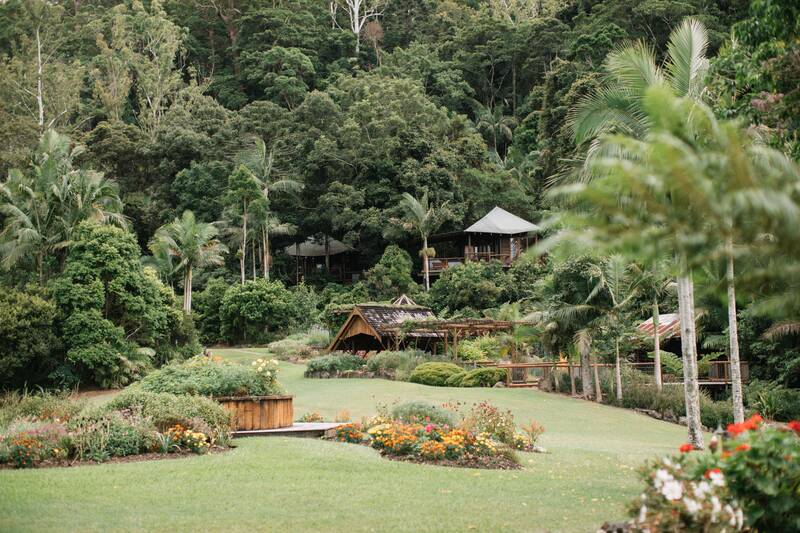 You choose the perfect time, the perfect season, the perfect cabin… with rustic, waterfront, and rainforest settings available you can be sure we also have the perfect location for your vows. We invite you to visit or contact us to inspect our facilities. Why not make some Secrets of your own and arrange a lunchtime tour to sample our incredible food at Dining on the Deck our daytime licensed restaurant. They say change is inevitable… however sitting here with the wisdom of my seventy plus years, the rate of changes and the extent of them is often mind boggling! 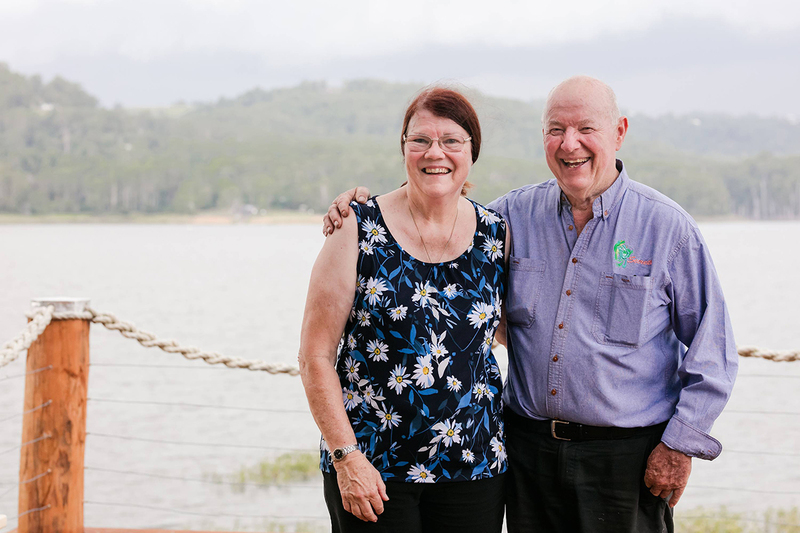 George and I have been in the accommodation business since 1994 with Secrets on the Lake. When we opened with our heritage cabin called The Whistle Stop, the key was left under the mat for guests to let themselves in! It was a simple world where guests gave us a call and made a booking by talking to us directly. They either posted us a cheque with the deposit or gave us a credit card number and we posted their booking confirmation out to them… the original snail mail. There was no middle man and in general getting away was pre-planned event worked out between you and I communicating. Secrets has a vacancy. You are wanting to come stay. Instead of calling us or visiting our website (best found by keying In the actual website www.secretsonthelake.com.au) and hitting the BOOK NOW button… there are hundreds of booking sites out there vying to take commissions (anything up to 30%) out of the tariff that we need to charge. They then ask us to offer discounts or they themselves offer discounts out of the commission so our agreement to offer the same tariff is undermined. They don’t ask us for permission to do this, they just do it. Meantime you, the guest, are often paying more for your stay than if you had contacted us directly. Nobody wins but the international booking sites. But it doesn’t stop there! Other things complicate what should be a simple personal process. For your convenience, we have a Paypal account for when guests purchase a gift voucher online. Paypal charges a merchant fee of 3%. The latest ideas include Zip Pay and Afterpay. These allow you to pay off items in 4 regular payments in a regulated timeframe but have the use of them now. The cost to the accommodation owner is another 6%. Can you imagine the book keeping involved and the nightmare of keeping these complicated listings and accounts in order?! We ask our wonderful customers to bear this in mind and remember the simple way… by using our BOOK NOW button OR give us a call (07) 54785888 OR email us through our contact page. Bring back the personal touch and reap the advantages… you have the pleasure of discussing which treehouse you would like, or taking advantage of our money saving midweek specials, or getting some answers to your individual questions, or requesting a tailored version of a package, or a payment plan that suits you. The joy of it is, in addition to saving some money on your stay, we can begin to make a personal connection with each other again in this impersonal world. Those connections often leading to friendships… some of which are now up to 20 years old. Many of Secrets guests like to enjoy a massage as part of the relax, rewind and reconnect experience of staying in our beautiful treehouses. We have sought out the very best massage therapists in our region and made arrangements with them to come direct to your room… so you don’t even have to get out of your bathrobe! Our experienced Massage Team of Angela from Touch of Power (0407 136 794) and Marnie from Temple Wellness and Massage (0481 846 064) look forward to helping you with your specific problems. Angela has been offering a professional service in the hinterland for 20yrs, and Marnie has recently taken over the Temple Massage team. All our therapists are able to do singles or couples massage and offer you different packages and treatments designed to pamper, re-energize, and work away the knots and stresses that plague us in our perpetually busy lives. How can you book? We ask that you book direct with the therapists who we have made arrangements with. Their contact details are found on our useful links page under the ‘About’ heading on Secrets on the Lake website. More information about their special packages can be found on our Massages page under the ‘Special Extras’ heading on our website. We find it less complicated if you book direct to arrange a mutually suitable time and in general it saves you paying the GST we would have to charge if booked through our business. View our Massage information page online at http://www.secretsonthelake.com.au/massage/ for more information and contact details for Angela or Marnie. Secrets Bookings now made easier. Available on all devices…. iPhone, iPad, Laptop or Computer. Our website has all of our information in an easily navigated format Visit us on a regular basis to check our special offers, now on the top of the home page, and to choose the extra add-on packages that we can offer. You’d can read our latest blogs and choose to order one of our gift vouchers through our online option or send an enquiry. Bear in mind booking through our website or alternatively giving us a call (07)54785888 will allow you to request one of our special offers or a particular treehouse. Secrets staff can assist with any of your booking needs down to tailoring your special occasion such as tips for your proposal, wedding, elopement, honeymoon, anniversary or long awaited holiday. Tips to bear in mind. A standard stay at Secrets on the Lake includes more than just a bare room tariff. Enjoy our sumptuous breakfast basket with its complimentary bottle of wine given only on arrival. It is unexpected and delightful and included in most of our standard tariffs. We have treats such as our afternoon tea home baked scones with strawberry jam and cream served complimentary on arrival. 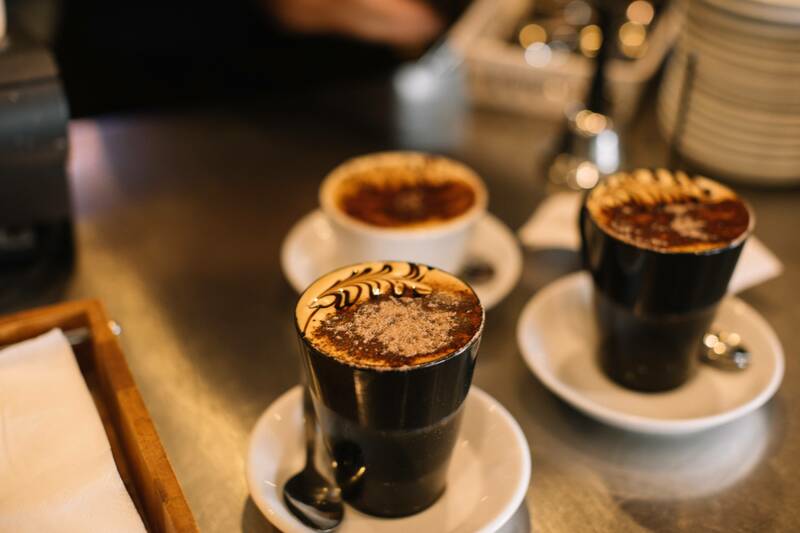 For seconds order the Devonshire Plate with beautiful coffee at our cafe. Our BBQ, picnic and meal options delivered upon request to your cabin means you don’t need to leave your treehouse and it is truly a holiday for everyone. In recent times, there has been a drought particularly here in the catchment of Lake Baroon. Any serious rain has seemed to bypass us and due to SEQWater siphoning off large amounts of water South to other communities and to Brisbane, we had been left with a sorry excuse for a water supply dam. However, the recent rains have helped to improve the water level as well as give a thirst quenching drink to our rainforest and gardens. For the past 12 months George has been working to bring our gardens to a higher level and with the help of Phil and Jeremy our maintenance guys, he has got them to an awesome standard. To top it off our son Rob has rebuilt the jetty and we have been waiting for it to get its feet wet. It is a stunning job! Celebrate your special occasions at Secrets on The Lake. Beautiful celebrations are the spice of life and we love helping you have things to look forward to. We make it easy for people to smell the roses. Romance is about the little things, and it is such a pleasure for us to see people taking good care of their loved ones. Doing little things for each other regularly adds lots of fire and spice to your special relationship. Whether you are looking to impress your loved one with a special little surprise or are planning a grand gesture of love, we are here to help. The Joy of Anticipation or Planning Your Annual Holiday Being in charge of a business often means you tend to neglect your own holiday needs. Over the years, the most memorable breaks have been the ones we planned and looked forward to. A decision was made, months out, choosing a time slot in what for us was a quiet time of the year. Itineraries were developed, money set aside, flights booked and accommodation chosen. Then, we sat back and looked forward to the time we packed our bags and were on our way. From then on it didn’t matter what happened, how busy or tired we became, what problems arose, we were going to have a break and the feeling of happiness in the decision and certainty was there buoying us up, no matter what happened in the meantime.